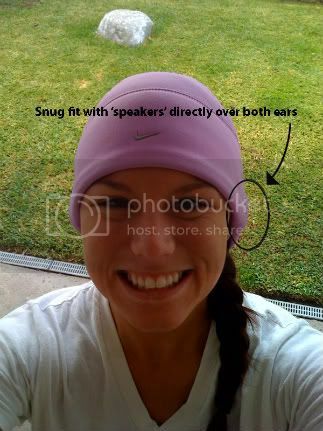 So here is the long awaited review of the Nike Hatphones that I recently purchased here.I am not going to lie to you, I was very skeptical of these hatphones to begin with, but obviously that didn’t stop me from buying the purple one at the bargain price of $15.97. 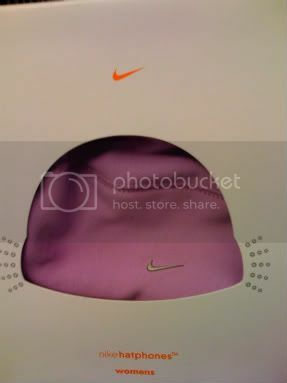 I didn’t really know what I would get with the hatphones as I always complain about the Nike.com site being very vague and un-descriptive and hard to understand. Normally priced at $60, I figured it had to have something special to make it that price but I honestly had no idea what to expect. Even after much researching I didn’t know if it was actually a beanie with speakers that would play my ipod, or if it was just a hat with an ipod holder. Low and behold the hatphones came yesterday in the mail. I think they are going to change my winter running life. It is by far the most amazing contraption I have ever seen or used. The hatphones has a little pocket inside the hat that holds your ipod. If you don’t have the nano sized ipod it also comes with a cord to attach other sizes of ipods. This inner pocket also has a mesh window on the outside of the hat so you can ‘mix your own tunes’ as you run, which basically means you can change the song, or change the volume on your ipod without having to take off the hat. 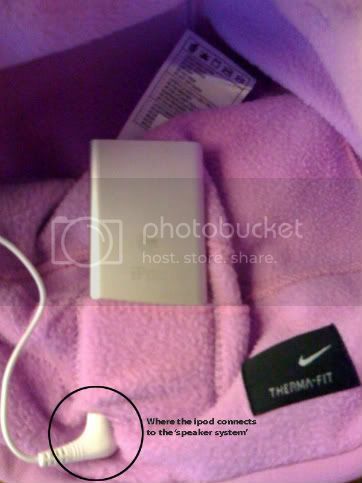 Inside the hat, next to the ipod pocket, it has a cord in which hooks up to the ipod and this cord is what connects it to the speakers. YES! I said it, speakers in the inner ear section of the hat. 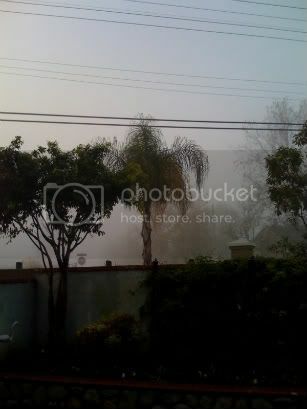 FOG (not smoke!!) Perfect weather to try out my new hatphones. Even though the hatphones had already exceeded my expectations, I didn’t know how good it would stay on while I was actually working out, if I would be able to hear the speakers, it they would stay on the right place on ears. Many questioned to be answered, so my research continued. I started off my run, and the had definitely did it’s true purpose of being hatphones. It kept my head super warm and my ears were also very warm as well. The hatphones never slid off and I didn’t have to continually keep tugging it down over my ears or forehead either. The speakers were very loud and I could easily hear my music during my entire run. The ipod holder inside my had didn’t bother me at all, I forgot my ipod was even “attached” to my head. The turn wheel is easy to use and there is even a little extra room in the hatphones for the Nike+ system. The speaker system stayed in place and were very comfortable and didn’t bother me or feel heavy at all. I was worried the hatphones would feel cumbersome, or uncomfortable, or even become to tight on my ears but this was not the case at all. I also was worried that I wouldn’t be able to hear the music out on the main street with many cars and other things going on around me, but the music stayed consistently loud but I was still able to stay alert and hear what was going on if for some reason someone honked at me. Please don’t judge me in these pictures! It was early and I just woke up. :) Overall the hatphonesworked GREAT, exceeded all my expectations, and I would give it the following grades. You still can get yours and they come in either white for $19.97, or the purple one like I got for $15.97. The shipping is inexpensive, and it took a week to get to my house. Be sure to pick one up here. You won’t be disappointed. Hurry, I’m sure the stock is limited! Also there are some other hatphones that can be found on the Nike site, that are still around $50-70 dollars, but seriously for the amazingness that is the hatphones, I would almost be willing to spend that much on them anyways. 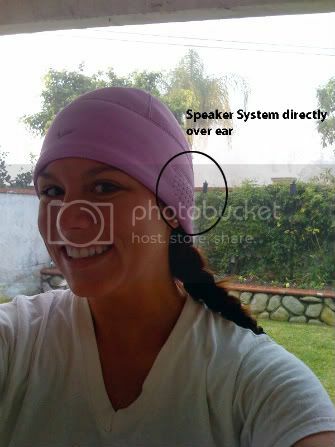 They are really a genius item, and especially with the holidays coming up, think of any runner in your life that might want their own hatphones.